Playgroups NSW link parents with playgroups across the state. Search for a playgroup near you on their site. Find A Playgroup. Please find below various headings for resources to assist Parents and Carers. Simply click the heading to open the section to find more information. The Family Referral Service (FRS) brings together families, support services, and community resources so that our children and young people are safe and well. Inner West Library Parenting Resource listings. 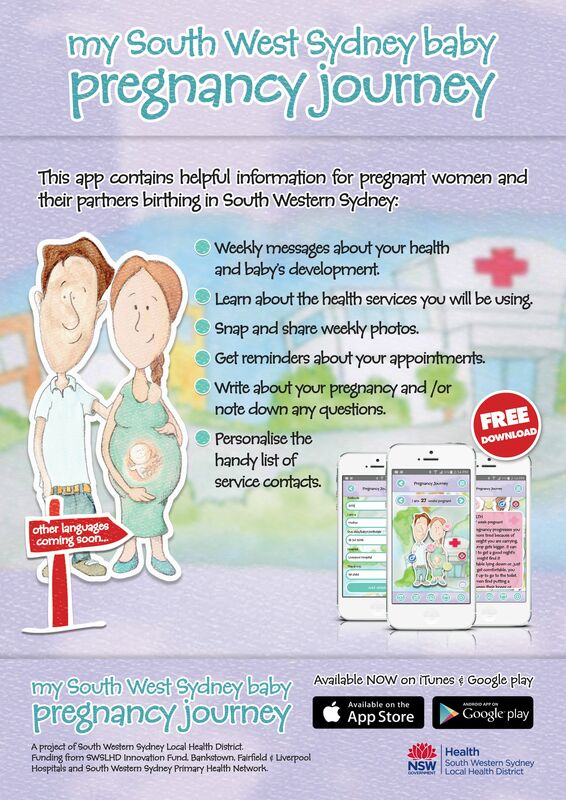 My South West Sydney Baby Pregnancy Journey App contains helpful information for pregnant women and their partners having their baby in South Western Sydney. This guide has been developed to assist local services to refer families to local nonmedical services. It was specifically designed with the needs of GPs and School Principals in mind. However, we hope that it will be useful for a range of services. Play and Sing-a-long to your very own copy ‘Lovely Jubblies” Listen to the song online or download the MP3 fror FREE. Posters for download are also available. Playgroups Directory for Botany, City of Sydney, Marrickville, Randwick, Rockdale, Waverly & Woollhara Local Government Areas. Print this simple guide to three services linking families to local supports and information in the Sutherland shire and St George. Families NSW - For information on the NSW roll out of Triple P Groups and Seminars. The NSW Government's prevention and early intervention strategy for families expecting or with children aged 0-8 years. Funding through the strategy makes this web site and all three parenting projects possible. NSW Health Kids and Family For information about the NSW health services for children and families including the Blue Book The Personal Health Record all children in NSW receive. Translated PDF Blue Books are available in 19 languages. The NSW Directory of Child and Family Health Nursing Clinics can also be found here. Tresillian has a wide range of specialist services for families with a baby or young child. There is also the 24hr Parent Help Line 1800 637 357 free call outside Sydney. These related resources are specifically designed for parents. They provide information and strategies for parents whose child is showing bullying behaviours at school. This eight-page guide provides parents with information on bullying, warning signs that their child may be bullying others, and practical steps that parents can take to prevent bullying behaviour getting out of hand. Children can't learn without making mistakes - it's how we help them deal with those mistakes that matter. This two-page handout outlines 10 positive actions parents can take when their child is bullying another child. A one-page visual guide on how parents can best respond when their child is bullying another child. Three key actions are outlined, together with examples of what to say when talking with their child. The Australian Parenting website with an enormous amount on parenting and child development go to www.raisingchildren.net.auyou are also able to order their 5 hour DVD on parenting children from 0 to 8 from this site. Click here for full section on Resources for Aboriginal families with some great down loads and links. Click here to go to a summary of the nationally available parenting resources for CALD communities. You can search by Topic ie. Toilet Training, or by Language ie. Urdu. Most of these resources are able to be downloaded and printed free of charge. Click here for the Resource Kit for Relative Carers addresses the most commonly asked questions by relative carers at support groups and during requests for assistance over the phone. This kit provides information, contact numbers and websites for support services, and a collection of stories from relative carers. Additional information is often provided by links to websites. Parents or carers of a child aged 0-5 years. The focus in this program is on the bond between parents/carers and their child. The idea of the circle of security helps parents to understand their child’s need for security as well as their child’s need for exploration. When parents/carers tune into the emotional and relationship needs of their child, the child’s behaviour improves. Children who feel secure in their relationship with their parents/carers show empathy, handle emotions, have good self esteem, good relationships and do well when starting school. DVDs are used to explain the idea of the circle of security. This can be run for groups or individual parents/carers over 20 weeks. This program has been shown to be effective, especially for families experiencing divorce, conflict, stressful events, mental health issues or disabilities, as well as adoptive parents/carers. Find out more about Circle of security. Circle of security, attachment, tantrums, parenting, parenting programs, behavioural problems, anxiety, foster children, smacking, parenting help, disabilities, toddlers, babies, self-esteem in children. Parents/carers with a child from birth to 16 years. Triple P seminars explain principles and techniques that can be used for different problems, such as tantrums, sleeping, bullying, and teenage withdrawal. It is suitable for families from diverse socio-economic, cultural and ethnic backgrounds. This is a system of easy to use, proven parenting strategies for parents to develop a positive and caring relationship with their child. The Triple P program is flexible with various levels of involvement. There are general positive parenting seminars, or parenting skills training, either about parenting generally or in relation to specific problem behaviours. Families can choose the level that suits them. An accredited Triple P practitioner runs a course with a group of about 10 people. There are four weekly sessions that run for two hours, followed by three telephone calls to discuss how things are going in the home and then a final group session. Triple P principles and techniques have been evaluated for the past 30 years and they work well. They have been shown to work very well with child behavioural problems, children with developmental disabilities and children at risk of abuse or neglect. Positive parenting, Triple P, tantrums, parenting, parenting programs, child behavioural problems, foster children, smacking, parenting help, developmental disabilities, self-esteem in children. Parents/carers with children aged 2-12 years. 1-2-3 Magic is a simple program that suggests effective parenting solutions without arguing, fighting or smacking. 3. Strengthen the bond between parent/carer and child. Parents/carers are given three strategies to choose from if a child misbehaves. The course aims to help parents/carers understand their child’s motivations, and how to emotionally bond with their child. Parents/carers learn how their own behaviour can influence their child and how to encourage cooperation around the home. Parents/carers who attended 1-2-3 Magic courses reported improvement in parenting practices and a reduction in child problem behavior and the impact lasted. This program has been effective with children with behavioural problems, children with anxiety, children experiencing emotional stress and children who are fostered. Find out more about 1-2-3 Magic. 1-2-3 Magic, tantrums, parenting, parenting programs, encourage good behavior, behavioural problems, anxiety, foster children, smacking, parenting help, difficult behavior, toddlers, children, teens. Parents of preschoolers, aged 1-6 years. It coaches parents to help their child to understand and manage their emotions. This is run over six sessions of two and a half hours in small groups. It involves individual, group activities and home activities. When parents learned these parenting skills, their child’s behaviour, emotional management and social skills improved. The program was very good for children with behaviour or anxiety problems, children experiencing emotional stress and for foster families. Find out more about Tuning in to kids. Tuning in to kids, emotional skills, parenting skills, child behaviour, behavioural problems, manage problems, anxiety, bonding, foster families. Children aged 7-13 years who are overweight and their families. This is a free program funded by the NSW Department of Health. At least one parent or carer is required to attend the program with each child. This happens to ensure that the strategies the child learns can be followed at home. Children and their families become fitter, healthier and happier while they have fun, meet new friends and learn new skills. It helps children to feel more confident and boosts their self-esteem. Children get fit playing games, try new foods and learn to set goals to maintain a healthy weight. This involves 20 group sessions after school, twice a week for two hours per session, run over one school term. There are nutrition and education sessions for children and parents together, and then the children go for an exercise session, while the parents/carers continue discussion and education. The sessions are facilitated by trained instructors. This program started in 2011. Trials of this program have been successful. It helps these children and their families to adopt a healthy lifestyle that they maintain. Find out more about Go4Fun. Go4Fun, childhood obesity, nutrition, parent and child programs, self-esteem in children, getting fit, healthy eating, exercise program for children, healthy weight. This program offers support for separating families, with children of any age, who are experiencing conflict. understand grief and loss after separation. An educational course held one night a week over five weeks. Parents interested in attending the course need to register and participate in an interview beforehand. Qualified and experienced parent educators and counsellors in a Catholic agency facilitate the course. Find out more about Keeping kids in mind. Keeping kids in mind, Catholic, divorce, separation, parenting, conflict, emotional stress, conflict impacts on children, divorce impacts on children, resilience.